BIM is now mandatory on all public-sector contracts meaning that it is vital for the supply chain and manufacturers of construction products to become engaged in the BIM process. There are a number of clear and important reasons why building product manufacturers should embrace BIM, incorporating object data development into their marketing and business models. Intelligent BIM objects offer a new and efficient way for designers to choose building components to use in their design schemes. As the implementation of BIM continues to grow rapidly in the Industry, higher demands are being raised to produce catalogues for describing building components and manufacturers data, especially at design phase. as objects specified to a manufacturer’s specification. Objects, whether generic or manufacturer-specific, contain graphical data relating to the geometry of the element, and non-graphical data, tagged to individual elements or subtypes. In objects provided by manufacturers, the level of definition may vary depending on the intended purpose and scope, but in general a lot of the manufacturer’s data is pre-populated. In generic components, on the other hand, non-graphical data can be introduced as it is required throughout the design process. ARCHICAD offers a number of ways for data to be introduced to the model as a project progresses. 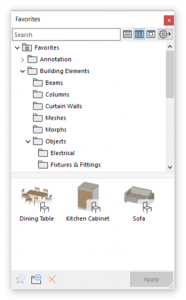 Firstly, generic elements from the ARCHICAD library contain predefined parameters, which control the geometry, but also include predefined description data fields. During design stage 3, the designer may only use parameters to control the approximate dimensions, but, by stage 5, have added further data for more specific detail, such as the manufacturers data and model, materials, and precise dimensions. ARCHICAD’s advanced toolset means that adding data to models throughout the design process does not need to be time consuming. Instead of manually typing in each value for each parameter, these can be prepopulated using preconfigured favourites of commonly used elements, or input for multiple elements simultaneously directly into element schedules. Favourites are used to save and apply commonly used tool settings and configurations, avoiding the need to repeat the inputting of data unnecessarily. They can populate both the graphical data, altering the dimensions and shape of an element, as well as the non-graphical data fields. Element schedules are primarily used to display and export relevant data alongside 2D drawings and the 3D model. However, schedules do not simply display data – they are bidirectional, and any data edited in a schedule will be reflected in the model and associated drawings. Where a model contains multiple quantities of an element type, these can all be edited and updated simultaneously using schedules. In addition to the hardcoded parameters, ARCHICAD also allows customisable user-defined element properties, which can be tagged to any design element. Element properties can be included in a standard template and also created on the fly as and when required. The values for the element properties can be populated in the same way as parameters, as described above, but they also offer the significant benefit of coordination with external spreadsheets. 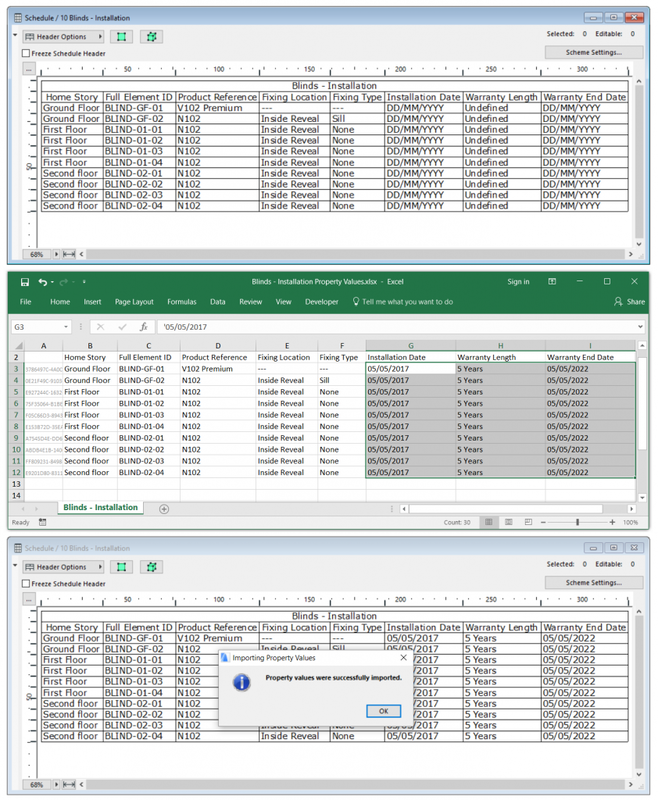 Further manufacturers data, for example purchase dates, serial numbers and warranty information required during design stage 6, can be completed in Excel by the installer or other members of the design or construction teams, and imported directly back into the model. Manufacturers do not have spend tens of thousands of pounds on creating bespoke BIM objects of their building components – just use their data intelligently. For manufacturers, this provides enormous potential to market their products and product range as objects are easy to access and manage on the Internet. It is also possible to link from the interface directly to specific pages on a manufacturer’s website, to access product specifications and manufacturers data sheets, or even to link to an online store. If you are a Manufacturer or work with a Manufacturer that is looking to produce intelligent graphical and non graphical data with access to thousands of designers then please contact our offices for more information.